Google believers and followers can now download customized Microsoft Internet Explorer 7 (IE7) which is optimized for Google, which means the IE7 comes pre-installed with Google Toolbar, default home page set to Google Personalized Home, and has Google set as the default search engine provider for the IE7 address bar and the instant search box embedded in the web browser. This is the logical offering from Google, as Yahoo! 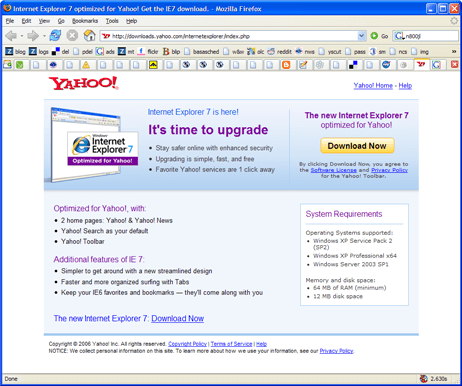 has previously made available IE7 optimized for Yahoo!, while original IE7 has all the Microsoft’s flavors, and both will steal the search traffic away from Google if the web surfers prefer the IE7, and use the IE 7 search box without changing the default search providers, or using the ‘wrong’ (to Google sense) home page. 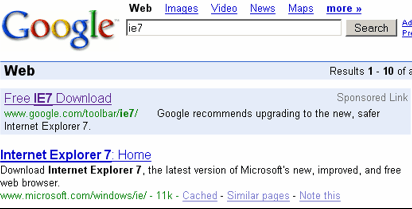 IE7 optimized for Google can be downloaded from here (no longer available). 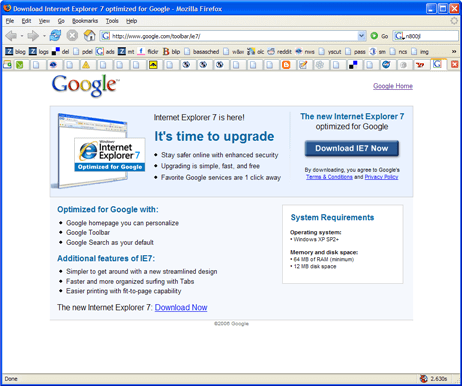 The Internet Explorer 7 offered by Google has exactly the same features and functionality as the original IE7 downloaded from Microsoft or built-in in Windows Vista, except for the changes mentioned above. Previously, Google has actively advertised and promoted Firefox browser which has everything defaulted to Google, and even has referral program that pays Google AdSense publishers for every download and install of Mozilla Firefox or Google Pack where Firefox with Google Toolbar is part of the software package. For IE7, Google has paid search listing as sponsored link that listed on top of the search results whenever users search for IE7 or IE 7 related keywords. Early in its availability, IE7 optimized for Google also drew criticism firestorm when its download splash page (no longer available) is remarkably similar in design, layout, text wording and even the sample customized IE7 browser image has blurred or grayed out Yahoo! Toolbar trace in it. Google has since changed the page totally, however Google IE7 browser has gain free viral marketing publicity. So could it be a marketing strategy of Google to release its customized version of IE7?